It has been, relatively, low-key start for the world’s most expensive player. Aside from his lavish unveiling, Gareth Bale’s focus has solely been on regaining his fitness and proving himself as a world-class player. 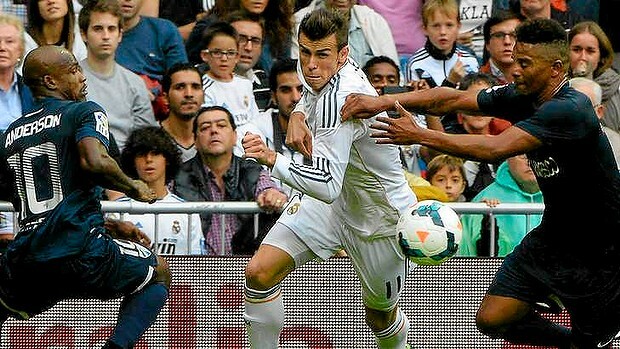 So, amid doubts about whether he was worth £80 million, Gareth Bale netted a poacher’s finish just 39 minutes into his debut against Villarreal on 14 September. Bale wheeled away and, coolly, brandished his signature love heart celebration. It has already set the tone for Bale’s Madrid career: capably stepping up to the next level in trademark, understated fashion. It was even evident in Bale’s next big moment in a Madrid shirt – against the backdrop of concern over whether Bale had a chronic spinal disc injury – when he won a penalty against Malaga a month later. Just eight minutes after coming onto the field, a trademark bursting run saw a clash of heels with Weligton Oliveira; there was no hideous dive or flash theatrics. Tellingly, Bale selflessly let Cristiano Ronaldo take the resulting penalty. It seems, following an incredibly frustrating few months – amid recurring niggles and transfer speculation – that Bale is settling in at the Santiago Bernabéu. The Spanish lessons have long begun and while Bale has only made four appearances for Madrid this season, it must be stressed that he played in 87% of Tottenham’s matches in the past three seasons. Admittedly, there is an irony in that statistic regarding Bale’s ‘injury-prone’ body: is Bale, simply, burnt out? Coupled with an incredibly disrupted pre-season, is this why Madrid have been so careful with Bale’s assimilation into the team? After all, this is a club whose medical department once believed Gonzalo Higuain’s back injury could be treated without surgery in the winter of 2010; the Argentine ended up requiring an operation, in Chicago, and did not recover until May, 2011. It left José Mourinho furious and was the trigger for the eventual departure of Jorge Valdano, with the Argentine – Madrid’s then sporting director – refusing Mourinho’s request for a new striker. Far from Mourinho using Higuain as a pawn, though, the Portuguese laid the foundations for closer relations Sanitas La Moraleja Hospital in the summer of 2012. Bale has been among those to benefit and while there is incredible pressure on the Welshman, being a part of such a glittering squad will only aid his development and ease the incessant, weekly demands Bale experienced at Tottenham. On the flipside, though, the honeymoon period – which, ironically, was far from a joyous month for Bale – is over and Madrid expects. Fittingly, then, Bale’s return to fitness coincides with one of the biggest weeks of Madrid’s season: a crucial Champions League match against Juventus on Wednesday and, then, El Clásico on Saturday. With just 155 minutes as a Madrid player under his belt, Bale is likely to be given 30-40 minutes in the second-half against Juventus and will then start 60 minutes of the game against Barcelona. To expect Bale to thrill in these games would be unrealistic but Carlo Ancelotti would only deploy Bale if he was fit and with that being the case, Bale is sure to thrive in what are sure to be two open games. A new chapter has begun in Madrid’s history: the role Bale will play in that will be a lot clearer after this week. Is the FAI taking the Mick?